No political rally is complete without a call to action from CWA’s tireless leader, Hetty Rosenstein. Here she is at last night’s Tom MacArthur town hall. To paraphrase The Bard (badly), there is something rotten in the town of Willingboro. During the past two days, several South Jersey publications have disclosed a rather disturbing story out of that small Burlington County town of about 33,000. Over the past year, administrators of the local school district have reported (at least) 171 iPads missing – or to be more specific – stolen. The information was actually revealed late last month due to an Open Public Records Act request taken on the part of the Burlington County Times. One report claims that the iPads were stolen in bulk in 2013 from the District’s warehouse. I’m not exactly familiar with its facilities, but this already stinks of some kind of inside job. The idea of some dingbat thief breaking into a warehouse usually reserved for pens, pencils and dry erase boards to hit this kind of jackpot – and get away clean – isn’t exactly believable. And what’s really irritating is that school and police investigators can’t seem to find who’s responsible. This kind of situation can best be summed up in a two-word term in constant use by my tween son’s generation: Epic Fail. The educational value of a networked iPad in the hands of a child cannot be underestimated. It’s a book, a note-taking device, an interface that illuminates in spectacular fashion the great works of art and architecture. It’s a global atlas containing every mountain range, country and territory down to the street level. It’s a teleconferencing device enabling a student to talk to peers from the largest urban center in Asia to the smallest African village. It’s a documentary machine, a recording studio, a radio, and on and on and on. And 171 of these magnificent learning tools were whisked away from the Willingboro’s school district warehouse, and nobody knows nothing. When Olympic medalist Carl Lewis announced that he was going to run for the State Senate back in 2011, a sense of pride permeated his hometown of Willingboro. Even though Lewis was living and running in the eighth district at the time (Willingboro is in the seventh), Lewis’ roots in South Jersey were legendary. He established the Carl Lewis Foundation, coached track for youngsters in Willingboro and was involved in physical fitness advocacy throughout South Jersey. Today, it was reported that when Lewis decided to run for the State Senate against Dawn Marie Addiego (who was originally appointed to the seat to fill a vacancy), Chris Christie threatened to withdraw support for a statewide physical fitness program in which Lewis was involved. You’ve got to give Christie credit – strong-arming a nine-time Olympic gold medal winner. There’s more below the fold. 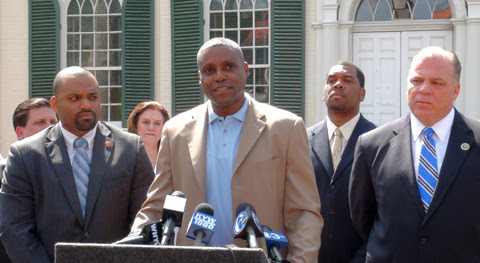 Photo is from Lewis’ announcement in Mount Holly – April 2011. Chris Walker is seen between Lewis and Senate President Steve Sweeney. When Barbara Buono first announced that she was running for governor, I gave her some unsolicited advice. I told her that the key to winning Burlington County was to get out the vote in Willingboro. That township voted 92% for Barack Obama in 2012, so there are a lot of Democratic votes ripe for picking. I’d like to think that she took my advice, but I’m sure her political experts would have come to the same conclusion. Buono formally announced her candidacy in Willingboro (as well as in another venue in North Jersey), and on the day after she named her Lieutenant Governor, Milly Silva joined the Senator at a rally in Willingboro, held today. Altogether, Team Buono has been in the township four or five times by my count. (Cory Booker, another astute politician, has also held numerous rallies in the town). Willingboro may not be the county seat (Mount Holly is), but the local county newspaper is published in Willingboro, the Democratic County Committee holds most of its meetings in the town, and the Willingboro Democrats are one of the most active and enthusiastic groups in the county. So Team Buono was there today to tour the Senior Center and rally the voters. Here are comments from Buono and Silva, along with the press conference. Here are the remarks delivered by Senator Buono when she spoke in Willlingboro on Primary Day. Her comments to Blue Jersey were posted here. Many months ago, before the gubernatorial campaign was at the top of everyone’s mind, I mentioned to Senator Buono that the key to capturing Burlington County was to rally the folks in Willingboro – a strong Democratic town – and get out the vote. I don’t know if she directly took my advice, or if she took the advice of her professional political staff, but it doesn’t matter. Today, during a swing through South Jersey, Senator Buono made her third visit to Willingboro during this campaign. The event was hosted by Freeholder Candidate and Willingboro resident Reva Foster. I’ll post Senator Buono’s speech in a few days, but here are some comments she made to Blue Jersey after her well-received remarks. There are political races and there are track & field races. Both types of races have much in common, and who better to explain that than Carl Lewis? Lewis, who won nine golds and one silver in four Olympic appearances, also ran for New Jersey Senate two years ago. Not one afraid of challenges, he opted to run in the heavily Republican eighth district where he lived. No doubt, his fame was one factor that helped formulate his decision to throw his hat into the ring, but unlike another famous Burlington County office holder and Michigan native, Jon Runyan, Lewis’ credentials went beyond his accolades in the stadium. He’s the founder of the Carl Lewis Foundation, which supports youth programs along with wellness and fitness. He’s coached kids in his native Willingboro and surrounding areas. Unfortunately, his political career was aborted by a lawsuit initiated by the GOP that successfully challenged his district residency on a technicality. Now, Lewis is leaving New Jersey for the warmer climate of Houston. Last night, he was presented with an award for all of his public service to the people of Burlington County, the people of New Jersey, and the people of the world. In his remarks, Lewis reflects on his Senate race, what he’s learned as an Olympian, a phone call he had with Chris Christie, and a message to those who think Christie should be President. We congratulate Mr. Lewis on the achievement award. As he moves to Texas, we hope that he continues with his involvement and enthusiasm to move that state from red to blue. In this video, Carl Lewis is introduced by Willingboro Mayor Jacqueline Jennings.